A lot of my dog friends are being killed off – on Facebook. We’ve had a nice, vibrant place on Facebook, with lots of Scottie people talking to each other and a lot of Scotties, with their own accounts, discussing the world from their paws. A lot of users have spent a lot of time there – it’s been quite helpful and entertaining. Only an idiot would try to kill it. Who could be that kind of idiot? Lord Zuckerberg and his minions. Rumors have been flying for a while that pet profile accounts were in jeopardy. But they were only far away animals, not even Scotties, so I paid little attention. Then a few months ago, Dusty Border Terrier got the axe, but he had already passed away, and was a Border Terrier, so it didn’t concern me much. Then last week, the pace quickened – first Dougal, then Becky Bluebonnet, and then, and this got my attention, Haagis McAttitude, one of the best posters ever. Then Snowy, then Ficelle, then Penny, then Figaro, then Buba, and it started to really really hurt. These were close friends. And this morning, Ruffs Kieslowski. My very first Scottie international friend. So that’s why I am here. A refuge from Facebook, a place far away from the evil realm of Lord Zuckerberg – a little modest place that I can control, and can assert my law. Because I wear a badge. We will follow you wherever you go Angus! Angus, I’m so glad you found refuge!!! Yippee. Now will you allow Ainsley access to this site as well???? Oh yeah….she’s a subordinate huh? What was I thinking?????? This is awesome Angus! You are at the top of my “Favorite” websites! Yippee Angus Fala….you are back and as badass as ever! Thank you for doinf this Angus. 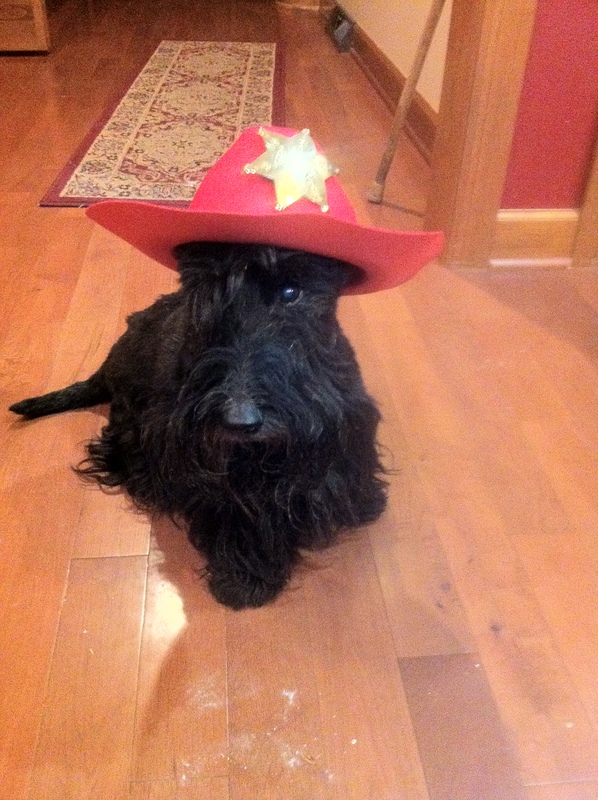 You and Ruffles were my first cyber – Scottie friends and now I have so many Scottie friends from all over the world. Lord Z just doesn’t know the power of the paw. Thank you for starting a blog, I check out your antics every day. I shall have to get a blogroll of all the other puppies. Angus doesn’t pull antics this is real life. Thank you for doing this Angus. You and Ruffles were my first cyber – Scottie friends and now I have so many Scottie friends from all over the world. Lord Z just doesn’t know the power of the paw. This is great, I added as an app on my computer! You rank right up there with Down Under Daisy and The Scottie Chronicles! You know what is even worse is that all these friends are no longer on my friends list. C.J. is gone now too. oh no! CJ? That’s horrible! The Rocky Creek Scotties at your service, Sir!! Ben reporting for duty, Sir! Rascal and Daisy are here! may the force be with you, Sarge! wait, we ARE the force, and we ARE with you. . . Welcome Angus Fala to the world of wordpress …. may you reign long and lively. We’re all behind you. Long Live The President. Yay !!!!! Lets give a big welcome to my fabulous friend Angus Fala, from a place called “facebook” that is culling all our scottie friends. At least there will be warm welcome from wordpress …… yay! oh angus I have followed you for so long. my day wouldn’t be the same without you. Kansas City clan accounted for. Woooooowooooooooo, welcome to WordPress Angus! I’m an Alaskan Malamute, but I’m a wooly so I wear a furry fluffy white kilt efurry day! Woooooooowooooooo! Kuruk – I know this is off topic but… my parents had several “wooly” Malamutes so next to Labs and Scotties they hold a special place in my heart my friend!!! You are an awesomely beautiful soul!!! A Malamute huh? I had a good friend that was a Malamute at the dog park back in the day. She was a lot less edgier than the Huskies. Those Siberian Huskies, gotta be honest, I don’t like em. I had a battle wound from one back during the Scottie-Huskies War of 2008. A wound right on the top of the head. But Malamutes – have no beef with. Think that treaty we have with Malamutes is still in effect. Glad to meet ya Angus. From the land of Twitter I come, to join you in your struggle. Followers there, now followers here. All is well. Stuart’s here! Yay! See Angus, this is coming along nicely. All our buddies are showing up POTP in action again. Abby & Arlo will follow you anywhere! Never had a FB account in the first place. She had one and it started sending out emails in Her name so She dropped it. He grew up in the same small town as Z’berg but at a different time. Even MY pet parrot doesn’t tweet. Sgt., I’m reporting for duty. Becky bluebonnet and side kick Pookie are reporting for duty! UN.BE.LIEVE.ABLE!! Well, we are very glad you have moved to WP and we are very pleased to make your acquaintance! Lori, I’m able to pull up the Legends page as of right now. I wish I knew how to help. Gigi/Chewy said she got their page back last year by contacting the BBB. I’m so sorry this is happening. Lori Glenn, you will be reinstated. It might take a while. I am so sorry this has happened. I left you a message on your Legends page. Hugs. Hi Angus…so facebook strikes again…we tried it for about three weeks…decided it wasn’t for us puppers…Mom hear that many social places are dropping not human post…..well come on over to blogger or wordpress and join us in blogville…we have many adventures real and fiction. Hop you will come by for a vist and see the fun going on. If you haven’t met my pal Angus Fala, you are in for a treat. He just launched his blog on the heels of the Evil Empire purging anipals profiles, which continues today. Head on over… Angus has much wisdom to share!